The new Hilton St. Louis at the Ballpark hotel is the destination that connects you with an innovative guest experience. Walk outside our door and you are just steps away from the new Busch Stadium - home of the St. Louis Cardinals, the Gateway Arch, Edward Jones Dome - home of the St. Louis Rams, America's Center, the Riverfront, restaurants and all of St. Louis, Missouri's major attractions.This St. Louis, Missouri Hilton hotel is a masterful architectural design with soaring lobby, spectacular city views of the new Busch Stadium and Gateway Arch, stylish accommodations, luxurious facilities, oversized, state-of-the-art business center, concierge amenities and a first-rate array of food and beverage venues, including the largest Starbucks in St. Louis, and an outdoor patios with spectacular views of the downtown skyline.Whether traveling to Missouri on business or pleasure, guests of the Hilton hotel can escape to their own field of dreams in our renovated guest rooms with views of the new Busch Stadium and the Gateway Arch. 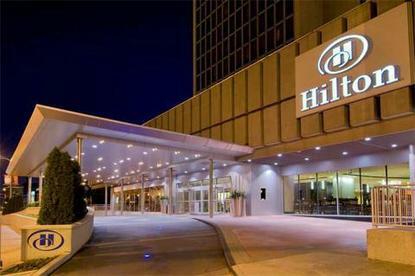 Yes, the outer world may be bustling, but your inner world is relaxed in the sanctuary of lavishly appointed and decorated guest rooms.The Hilton St. Louis at the Ballpark hotel presents a dynamic new vision and perspective of lodging, coupled with the legacy of flawless Hilton service. Inside - a world class hotel, outside - a field of dreams.Hilton St. Louis at the Ballpark Hotel Features Next to the new Busch Stadium, Steps from St. Louis' most famous landmark, the Gateway Arch, 40,000 square feet of flexible meeting and banquet space including the new Ballpark Conference Center, Newly renovated, state-of-the-art Fitness Center featuring Precor Equipment, Business Center, featuring eight work stations with complimentary high-speed Internet, Network printing from room to the Business Center, Complimentary color laser printer, scanner/copier/fax in Business Center, Complimentary wireless high-speed Internet in lobby Internet Cafe, Imo's Pizza, Valet and self-parking, Enterprise Car Rental Desk in lobby, Indoor pool and whirlpool, Full-service Starbucks in lobby, Market Street Bistro and Bar, Lobby Bar, In-room dining, Gift Shop, Concierge Desk, Concierge Lounge serving deluxe continental breakfast and evening hors d'oeuvres.Travel should take you places.